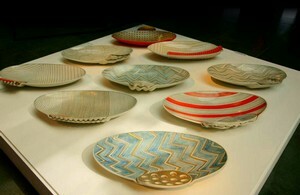 Traditions passed down over time shape the current photo of Yingge’s ceramic crafts culture of New Taipei City. These traditions have become irreplaceable resources for the development of the City’s cultural and creative industries. Yingge’s ceramic crafts, Jiufen’s nostalgic atmosphere, Tamsui’s historic buildings, Pingxi’s Sky Lantern tradition, and Pinglin’s tea culture have all evolved through fresh ideas and creative marketing to create innovative business opportunities seen today. The New Taipei City government supports local picture drawn by local artistic groups performing arts groups, funds creative activities and exhibitions, promotes community development of the humanities, and organizes international exhibitions, performances and art festivals. All of these efforts serve to enrich and increase the visibility of local creative and cultural industries. Renowned cultural and artistic groups, such as the Cloud Gate Dance Theatre, Liuligongfang, Ju Percussion Group and Performance Workshop Theatre have all made their home bases in New Taipei City. There are over 5,000 art and cultural activities in New Taipei City each year, attracting more than 20 million people. Municipal museums, such as the Gold Museum and the Shihsanhang Museum of Archaeology, attract some 4 million visitors a year. New Taipei City’s wide array of cultural activities ensures city residents access to a rich cultural life, while boosting tourism at the same time. The merging of culture and creativity with digital technology has led to a renaissance in the animation, comic, game, and film industries. The Taiwan Film Culture Center planned for the Xinzhuang New City Center will become a key resource for the development of the lm industry. In addition, construction of the Knowledge Industry Park on the north side of the Xinzhuang New City Center will encourage the clustering and expansion of digital content companies. It will, at the same time, help turn New Taipei City into a virtual digital entertainment park. The Far Eastern Communications Park in Banqiao is also attracting the animation, comic, and game industries, thereby injecting new energy into the dynamic and innovative culture of New Taipei City.